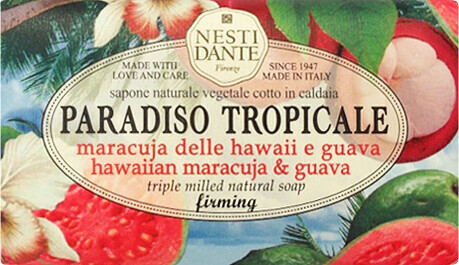 A tropical retreat awaits with the Nesti Dante Paradiso Tropicale Hawaiian Maracuja and Guava Soap Bar. This fragranced soap is handcrafted using ingredients inspired by the tropics, its mesmerising scent taking you on a fragrant journey through an exotic island. Luscious and vibrant, this triple milled natural soap is enriched with passiflora edulis fruit extract, which firms, tones and nourishes the skin. An indulgent treat for the skin and senses, the handmade soap is created using the traditional cauldron method to sure a rich, luxurious formula that leaves the skin supple and soft. Massage the soap all over damp skin into a lather, rinse thoroughly.